What seems to be a gutter fl owing across the city of Shankhu was once most accessible water canal that flowed along the doorstep of nearly 1000 household located in 8 Toles (small villages) of the settlement. Few artistic stone spouts are gaping dry to remind this generation of the source of the water in Sankhu in the past. The PRAGATI project has joined hands with the elected bodies to restore some of the ponds in the area, mainly for extinguishing accidental fire and to promote tourism. In ancient time, ponds and canal were key components of water management system in the cities. There were three major components in the system (i) the rajkulo (the water canals), (ii) the ponds and wells (iii) stone spouts. The system integrated these components to ensure water delivery at doorstep and avoid wastage. The rajkulo was meant to irrigate the agriculture land, recharge the ponds and also for daily chores. “The ponds are meant to recharge ground water and manage micro climate. From a disaster control perspective, people managed to have water in their community to put off fire since they didn’t have fire brigade back then,” says Pramod Simkhada, Chief Executive officer of Shankharapur Municipality. The wells and stone spouts were the major source of drinking water. Altogether 18 stone spouts (nine inside the settlement and nine outside) served people for different purposes. At present only five are functional. With the change in water supply system these wells and stone spouts, ponds and rajkulo are gradually losing their value. Wells are used when there is no alternative to drinking water or when supply falls short. The older generation still values them. Though many of the younger generation are “aware” of its value it is merely part of their daily life. Owing to the unmanaged urbanisation, the route of the rajkulo was disturbed, the “gifts” of modern society (plastic waste particularly) clogged the route while inadequate maintenance resulted in deposit of sediments narrowing down the rajkulo, a major supplier of water for ponds and hence operation of the entire system. These entities of water system were integrated with the utility and cultural values that ensured their conservation. Some ponds are symbolic such as kalash pokhari represents “kalash” (good omen) while entering the city through “bhau dhokha” (a gate specified for entry of new brides in the settlement). The lotus from the “pala pukhu” is offered to Bajrayogini temple- one of the main goddess for the city. A pond is an important part of the Gatha Mangal festival. Besides cultural value, these water resources held importance from disaster response perspective- particularly fire. The settlement is compact and dense; possibility of spreading fire is very high. Hence, having the sources of water close was the most practical way to put off accidental fire. Hazard identification process has reckoned fire as a major hazard after earthquake in the settlement. Although the municipality is in the process of managing fire brigade, it is difficult for them to navigate through the narrow lanes. Hence, not having water resource in the settlement poses higher risk of damage in case fire starts. Nagarkot Community Homestay is located in Bastola Village of Changunarayan Municipality. This homestay location is 11.3 KM North East from Tribhuwan International airport. This homestay consists of 17 units. It was a good alternative source of income for the families before the 2015 earthquake. The PRAGATI project’s stakeholders mapping action has identified that average yearly income of the homestay was from NRS 150, 000 to 200,000. The 2015 earthquake damaged all homestay units forcing the operators to shut down their services for months. He shared that the business thrived well and they were also planning to launch effective promotional activities. Unfortunately, the earthquake destroyed not only the houses but the future prospects the business could bring on. Each homestay unit was the home of 17 families. All of them have red stickers that make them eligible to receive the government grant but some policy constraints are discouraging them to go for reconstruction. As per new policies, these homestay families are compelled to allot a part of their land for the road access leaving very limited area of land for reconstruction. They need to follow the policy in order to qualify for money to be received from the municipality. Some of the families are investing their own money to reconstruct the houses on the land where they exactly stood before. Local Disaster and Climate Resilient Committee supported by the PRAGATI project organized a street drama on Earthquake safety at Chalakhu Tole of Shankharapur Municipality. More than 200 community members watched the street drama that conveyed the message of the earthquake safety tips (before, during and after) the earthquake. Safe building construction technique was also one of the components of the drama. Many people shared that the drama was useful for them as it explored the issues that they have been ignoring. To create difference or just for an event? While the entire country was celebrating National Earthquake Safety Day on January 16, 2018, Shankharapur was relatively quiet. Unlike last year, when thousands of people from Shankharapur and different organizations took over the street of Shankhu to commemorate NESD, this year only handful of youth and community members joined community level event. Shankhu, one of the most affected areas in the 2015 earthquake did not celebrate the day like others did. What was achieved of last year’s national event in Shankharapur on NESD? An intimidating question could be clearly observed in most of the people’s face. For the community it seemed to be just another day. Nevertheless, ward 6 and 7 of Shankharapur Municiplaity in collaboration with VSO and NDRC Nepal organized a rally to commemorate the day, Community Action Learners from United Kingdom and Nepal accompanied by children, youth, women, elderly people and ward 6 and 7 chairperson and members of disaster management committee of in a rally raised their voice along the street, narrow lanes and chowk of Sankhu. They urged people to contribute for a capable community and local community to develop stronger foundation for earthquake safety, the slogan of NESD 2018. Along with it they also carried messages of constructing houses in safer location, identify safe location in community, practice safety measures to minimize impact of earthquake, abide by building codes while constructing houses and stay prepared. Slogans chanted by merely 55 rally participants resonated in all 8 toles of Sankhu. The spectators observed the rally with hope and desperation; hope of some tangible and effective actions from municipality and desperation of reconstructing their houses and heritages. While some did not hesitate to ask if government will provide fund on time to reconstruct their house, the others relayed their wishes for success of the event. “It is quite inspiring and embarrassing at same time that the foreigners are carrying banners and raising their voice for our safety,” said an elderly observant of the rally. Attracted by Nepali chants by a foreigner, they expressed their concern on meaningful initiatives from government to translate words of slogan into action. Seeing the rally pass along the remains of wrecked building, I felt need of such event to raise awareness. But looking at hope and desperation of people standing along the narrow lanes of Sankhu called for urgent tangible actions. The event concluded with an event to orient the community on insurance as risk transfer mechanism for community. Attended by nearly 30 participants, mostly women the facilitator oriented the participants on insurance, and ways insurance can contribute to minimize the loss of insurance. Clearing the common myth, the facilitator said that insurance is an investment while it is commonly perceived as expense. “The insurance amount will definitely pay back,” he reiterated. Along with the concept of insurance he also discussed different types of insurance that is commonly offered by the insurance companies. The participants were excited to know that the government provides 75% of the insurance amount for animal husbandry and agricultural products. The facilitator suggested communicating with local government to access these benefits. The participants raised their practical challenges of ownership of land, property valuation to get benefits to purchase insurance schemes. Responding to the queries the facilitator suggested in communicating to service providers for customized solutions. It was really satisfying to see people returning happy with the session as they called it a more practical approach of giving meaning to NESD. It was a forum where they were clarified on tools to reduce their risk and receive answer to the question that haunted time and again. “We are less aware of such companies here in Sankhu. It would have been much better if could have helped us to connect with the insurance provider with relevant schemes,” a participant suggested. From the reflections from both events I felt that there is no denial that the celebration special days should be utilized to raise awareness. While we talk about capable community and local government, along with chanting slogans it is utmost important to widely discuss on tools and approaches to make community and local government capable. The community at Sankhu waits for practical solutions along with awaring them on earthquake safety. It is utmost important for organizers to take some approaches that will at least lay foundation for delivering practical solutions to community and making stakeholders more accountable to deliver those solutions. I have experienced a drastic change in myself in the duration of three months. I have gained many useful experiences during my work. I am glad that this project has provided the opportunity to enhance my level of knowledge regarding disasters. I am able to disseminate the difference of hazard and disaster to the community people. I am happy to make small contribution to my community. This Project is mainly focused on Disaster Risk Reduction (DRR) in Shankharapur municipality with ward 6, 7 and 9 as major working areas. I am excited to be the part of the project as it also works in my community. With the introduction of the project, I am glad that I got an opportunity to coordinate with mayor, vice mayor and ward president of the municipality. Also I came to know, how effective planning helps in achievement of desired goals within the timeframe. I have learned how every work should be performed by making a proper schedule so that we can get the required outputs in the desired time. I have been working in this project for 4 months and during this time I came to know about the necessary procedures for the conduction of a project. It was understood that for conducting any program, many informal meetings are to be held. For example: we have successfully formed Disaster Management Committees (DMC) and Municipal Disaster Management Committees in three wards. For the formation of DMCs, we had to work in different levels. In first level we had to conduct an informal meeting which was possible during the construction of the road in the community. After several efforts, our proposal for the formation of DMC was finally accepted and thus the committee was formed. Sometimes I became disappointed when I had to wait for many hours to meet the ward President but he had very limited time for us. However, I get really delighted when I meet people who appreciate our efforts. I am really happy to work as a social mobilizer in the project which has also build my confidence level. On a sunny morning in the outskirt of Kathmandu, hundreds of young children took out a rally to remember the ugliness of disaster and sensitize messages of disaster risk reduction and prepare for future disaster with a theme of ‘Our Home, Safe Home’. The rally was organized also to celebrate the International Disaster Reduction Day. 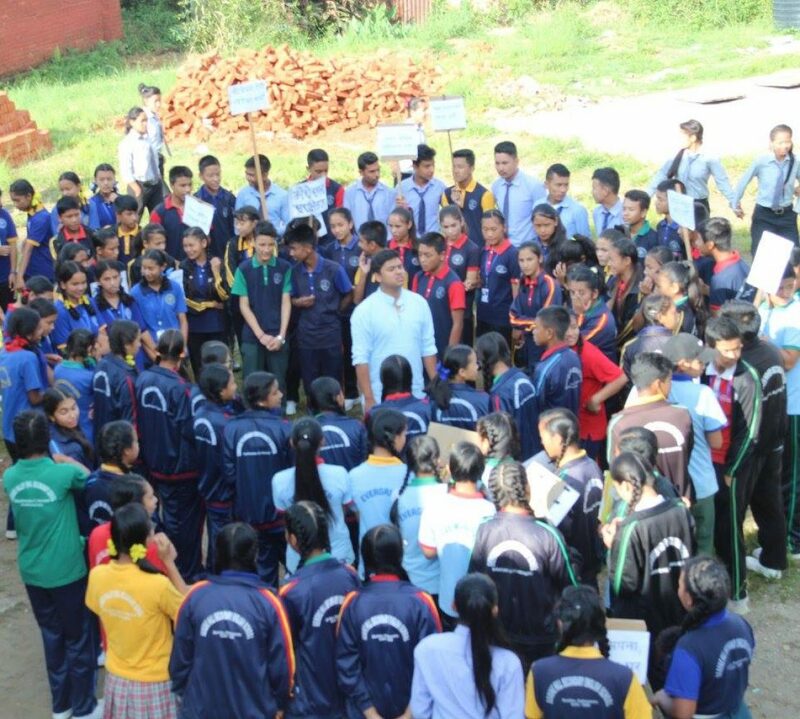 At least 240 students, teachers, political leaders, bureaucrats among other participated in the rally that basically sensitized the issues of disaster among the communities those are slowly recovering from the pain of the 2015 earthquake. Many students share that participating in the painting competition was very useful for them to understand the issue of disaster. “Such education about safe building construction should be included in the text books,” Samikshya Shrestha of Serene Hill Secondary School said. “I learnt a lot of techniques about building construction while participating in the competition, the instructors orient us about safe building construction.” She added that she can now explain her parents about the need of earthquake resilient buildings. He believes that the four paintings painted on the wall of municipality office will help aware and recall people about safe building construction. Samikshya and Suraj smiled, looking at their paintings painted on the wall of the municipal office. “I am very happy that my painting is here,” said Suraj. In his painting, he tried to aware people the five useful things t o do through the five fingers. “Every finger is important for us so do these five techniques,” he said. He added that it’s not the earthquake that killed people, but the infrastructure made by the people themselves. He explained that in the first finger, it says, anything in the house, including TV should be tied properly, the second explains the need of open spaces to evacuate, the third says the houses should either be properly tied with iron rods or retrofitted, fourth says the proper use of the wall and the fifth to place flower vessel in the proper places. The European Commission Humanitarian Aid and Civil Protection Department (ECHO) funded “Promoting Resilient and sustainable urban Growth by Augmenting DRR capacity of Local Authorities Through active private sector Involvement” – PRAGATI project organized this event in the Shankharapur Municipality in collaboration with the Lumanti Support Group for Shelter and in coordination with Shankharapur municipality office. The ECHO funded PRAGATI project has been launched in two municipalities Changunaraya Municipality in Bhaktapur and Sankharapur Municipality in Kathmandu district. Three international agencies – DCA Nepal, ADRA Nepal and VSO – has formed a consortium to execute this project through their local partners Friends Service Council Nepal (FSCN) in Changunarayan and National Disaster Risk Reduction Center (NDRC) in Sankharapur Municipality. DCA is leading the consortium.